Item is a 7x5-inch photo contained in a 9-1/2 x 7-1/2 inch photo mount. 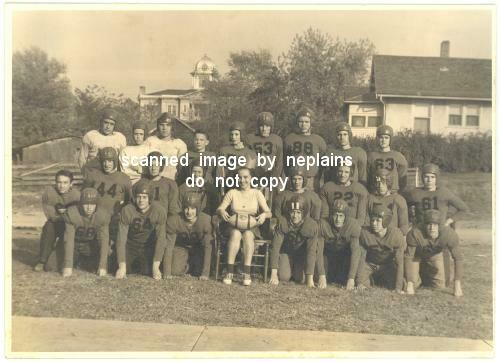 It shows a football team in uniform, with the homecoming queen (?) seated at the center of the front row. 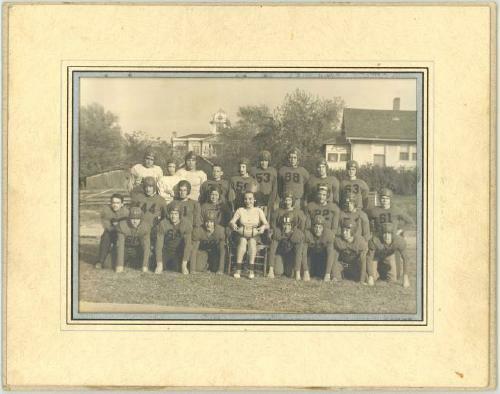 Names of persons in the photo are handwritten on the back of the photo mount. A few of the names are: Booth, Trotter, Weldon, and Moulin. The exact location of this photo is unknown; the town of Gallatin is suggested because of where the photo was found and the appearance of the court house in the background. The photo is in excellent condition and doesn't have any tears or creases. The photo mount has a few light smudges at the edges (from handling), but it is otherwise clean and sturdy.